Great quality with competitive prices, it is easy to see why Castelli notebooks and diaries are so popular as branded promotional products. As well as the usual size and finish of notebooks you might expect from an established brand, Castelli products also come in some more unusual sizes and cover textures, so if you are looking for something a bit different, it’s well worth a browse through their range. There is a vast array of colours to choose between; from the classic black option, to soft pastels all the way through to a vibrant greens. 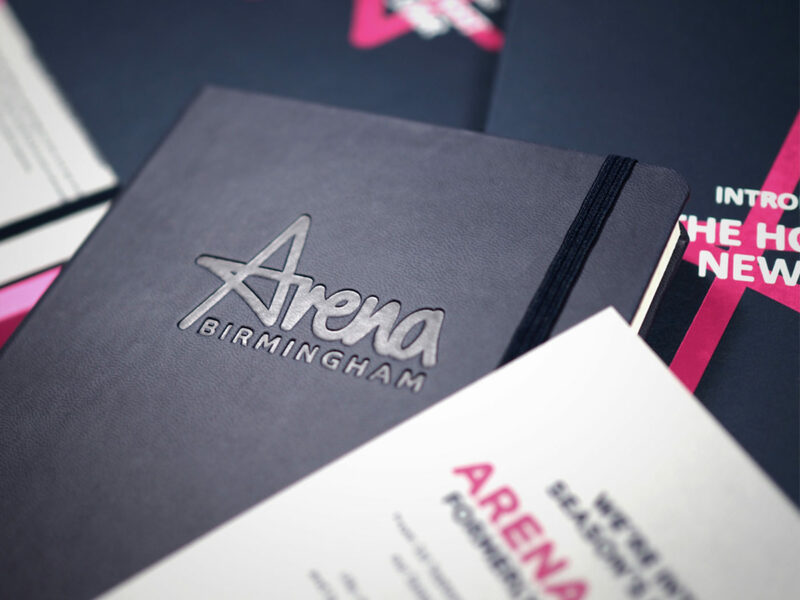 Their hardback and softback notebooks, together with a selection of diaries, lend themselves perfectly to all our customisation processes allowing your brand or logo stand out from the crowd. See our entire notebook and diary range where you can filter by brand, size, colour and material. The soft grained, leather-look Sherwood hardback notebook provides a beautifully luxurious feel at an affordable price and is available in A4, A5 and A6 sizes. If you are looking for a more premium feel, the hardback Cordoba A5 notebook has a luxurious fine Italian leather cover with a subtle grained effect. The Oceania hardback notebook with its crocodile leather-effect cover offers an even greater tactile experience, but it’s not for everyone. The ever-popular Tucson notebooks, with their soft touch covers and seventeen colour choices are available in A4, A5, A6 and a unique square format. There’s also an A5 flex-cover version in a selection of core colours. The stylish Mirabeau soft touch notebooks have a smart clasp closure feature. Other options include the Pen Notebook with a pen shape cut into the pages of the book. The A5 Phoenix hardback notebook is striking with its gold edges and red, orange or green edge stitching with matching colour pen loop and ribbon marker. The softcover notebooks also include the Novara flexi-cover, offering a soft grain finish and colour co-ordinated closure band and the beautiful Vitello real Italian leather A5 notebook. Diaries were the start of it all for Castelli and to this day they continue to make a vast choice of formats and sizes. Of course, even in the digital age paper diaries continue to be a useful, well-received corporate gift. We sell the Castelli Tucson diary collection, which is available in a huge choice of colours, with weekly and daily page options, in three sizes. Castelli notebooks deboss exceptionally well, resulting in a crisp finish that captures a design’s fine detail. Foil printing can transform a Castelli notebook, with classic gold, or timeless silver, or even a vivid colour foil to create a bold, striking effect. If you require a Pantone match, then screen printing is the perfect option, while UV digital printing offers full colour customisation and the chance to recreate photographic imagery on your product. If you would like to personalise your Castelli notebook or diary further, we can provide up to 12 additional inserted pages. These offer extra space to really express your band or provide specific information relevant to a product launch or training event. For high visual impact, belly-bands are a great extra option. These are strips of paper which wrap around the outside of a diary or notebook. They can be personalised with individual names and printed in full colour with your designs or you can have us create artwork for you. Presenting your beautifully customised Castelli notebooks or diaries in boxesor gift bags will make a great first impression. These can provide additional space for company branding or information. We can also shrink wrap your corporate gifts, if required. Not sure which product is best suited for you and your brand or message, just give us a call and the team will help advise you on the best options.